One of the most compelling chocolate creations ever, this is Teuscher's signature specialty. One bite, and you'll discover the sweet decadence praised by customers and food critics alike. 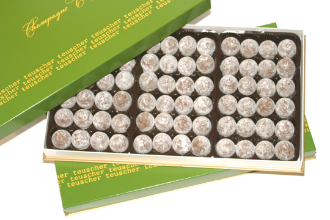 Some 70 years ago in the Swiss mountains, chocolatier Teuscher created The Champagne Truffle by which all others are measured - enjoy the original Champagne Truffle from Switzerland! Despite the technology involved in today’s food manufacturing processes, our Champagne Truffle is still being crafted just as it always has been, using only the purest and highest quality ingredients, never any preservatives or hydrogenated oils. The Champagne Truffles are made to order and shipped weekly from Zurich to ensure the utmost freshness. The Champagne Truffle has a dark chocolate ganache center that is enriched by a creamy infusion containing finest Dom Perignon Champagne. Its enrobing consists of milk chocolate and it is finally sprinkled with confectioner’s sugar to produce the Champagne Truffle's distinctive look.In November 2004, Oprah featured our Champagne Truffles on her Oprah's Favorite Foods show with Colin Cowie. You may choose to select our newer truffle version with the dark chocolate cover.